Anyway, if you want to develop for a Nordic nRF52 Dev Kit on a Mac, I’m going to show you how to setup your machine, how to start a quick project, and load it onto the board. Building and installing an example project. My hope is that this is enough to get anyone developing for the board. I won’t be covering debug tools (because I haven’t figured out how to yet) or more general programming things like How do I write a Makefile?, or How do I utilize the SoftDevice to get Bluetooth? I probably don’t know the answers to these questions, but this is what’s worked for me*. After you download that, expand the zip file and inside you’ll find the nrfjprog directory. Move that directory into that same /usr/local directory you made earlier. This is for convenience, you can put it wherever you want. Lastly, you’ll want to add the nrfjprog program to your path. This will allow you to use it from anywhere. We do this by adding it to a .bash_profile file. If you don’t already have one, make one in with any plain text editor. Be sure to include the . at the front. Go to https://www.segger.com/jlink-software.html, and download the Software and documentation pack for Mac OS X. It’s a pkg file, open it, install, and you’re done! Congratulations! You have the compiler and flasher installed. That was pretty easy, right? The nRF5x chips have an SDK that makes developing for them much much easier. Instead of having to slog through a lot of setup, Nordic has already done that work for you so you can do the fun stuff. 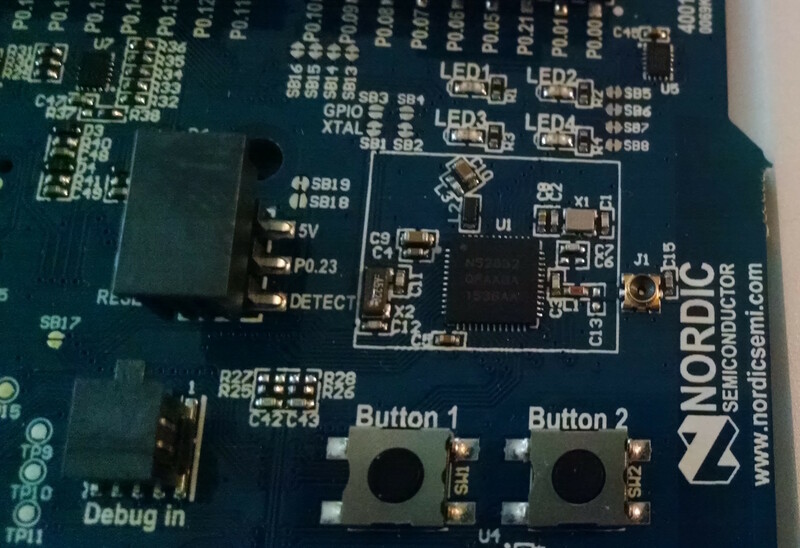 The current SDK is the nRF5 SDK. This applies to the 52 series as well as the older 51 chips. You can find it here under the downloads tab. Download that. As of this writing, the SDK is version 11. You can put the SDK where-ever you like. I keep mine in a directory off my home called Development/nRF52/ When I expanded the download, the name was nRF5_SDK_11.0.0_89a8197, I just renamed it SDK. It shouldn’t make a difference. Once you have it where you want it, we’re going to make a couple of simple changes. In the SDK you should be able to find the file components/toolchain/gcc/Makefile.posix. This file is going to tell the SDK where to find a couple of components. Boom! That’s 2 steps down! You’re making real progress now! Well done! 3. Building and flashing an example project. You made it to the fun stuff! This one is going to be quick, because all we’re going to do is compile and install something that already exists. There are lots and lots of example applications included in the SDK. It’s really great. My preferred starter app is blinky. In the SDK, you should be able to find it at examples/peripheral/blinky. It’s a simple application that will blink all four LEDs on the nRF52 board in sequence. In this directory you’ll find the source, license, an already compiled hex file, and several directories that begin with pca. The pca directories are board configurations. 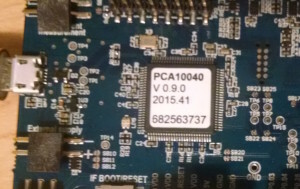 My Dev Kit has a sticker on it that kindly tells me which board I’m looking it. It built! Now lets install it. Erasing code and UICR flash areas. And if everything worked, you should be looking at BLINKING LEDS, OH MY GOSH, THIS IS THE BEST DAY EVAR! †According to the internet you can do this via homebrew in a more automated approach. I’d already written this when I discovered it. Either way should work. Thanks for this fantastic setup guide! Exactly what I needed. Looking forward to your article about writing a custom program. And please keep going, Awesome. Pingback: Getting Started with Nordic nRF52 on a Mac « Adafruit Industries – Makers, hackers, artists, designers and engineers! ERROR: There is no debugger connected to the PC. nrfjprog utilizes the libraries provided by segger for the JLink onboard the Development Kit. Thanks, Aaron. I have already downloaded the software. When I use JLinkExe, I get the following error. Connecting to J-Link via USB…FAILED: Can not connect to J-Link via USB. Hmm – that is unexpected. First things first: Are you sure the board is plugged into your Mac, and that the switch on the board is “on”? Thanks, Aaron. Looks like the board I received is defective. I am getting a replacement in a week time. I will give it a try after receiving the new board and let you know. I’m glad that it was helpful, and it’s good to hear that it works on Sierra. I’m still on El Capitan myself. thanks for the article. Really helped me today to successfully make installation on my macbook. One question, which IDE is best for developing apps on nrf52? I’m new to this so I’m looking for best options. I’m glad the article helped. The best IDE depends a lot on what you want to do. Kiel is the go-to recommended Nordic solution, but it’s expensive and Windows-only. Personally, I use Atom for writing code, and compile and deploy via the command line. I don’t have a solution yet for debugging on-the-fly. If you find something that works well for you, please let me know. I’ll maybe go Visual Studio Code just because it’s more friendly to C.
Additionally – I will note that one IDE I particularly like (though it’s not a perfect match) is QtCreator. It has a “Bare Metal” kit that you can use for deploying to devices. WTF!?! My brain just exploded. This is quite possibly the most easy-to-use and well-written tutorial on getting ANY microcontroller set up right from opening the box to flashing the application. You sir, are my hero of the day. Well done. Thanks Jon, I appreciate the compliments. nrfjprog 9.3.1 could not find libjlinkarm.dylib (6.12a) unless the library is in the same folder where you run nrfjprog. My Macbook Air has OSX Yosemite 10.10.5 – I can run “make” or “nrfjprog” only if I copied libjlinkarm.dylib into the same folder that I execute the make or nrfjprog. I appreciate any suggestion to fix this issue. “We do this by adding it to a .bash_profile file” this is where the tutorial ended for me. No explanation what it is and how to do it. You just assume we all know that and keep going. Whats really amazing here, is that there are people who still think writing software in this way ( using command line and machines syntax) is the right way in 2017, because it feels more “pro”. I was so happy till I found out that this is not a real tutorial for having a real tool, but just to show that you know how to program a chip. Wish one day you will grow up and understand that humans should have tools for humans, even for writing machine code. I can see how that wasn’t obvious. The .bash_profile is a file that OS X uses to save preferences in the terminal. It’s not clear to me what you were expecting. This tutorial was written to fill in a gap that exists in terms of loading code onto an NRF52 dev board from a Mac. I didn’t write it out this way to be “more pro”, or seem overly technical, these are the tools that exist, and the libraries that are provided by Nordic. Can you clarify what you mean by a “real tool” or a real tutorial? I agree that it would be wonderful to have tools that are easy and obvious for all kinds of people, but we’re limited by what manufacturers provide us. There are many other tools for humans, such as Segger for mac, Eclipse, Xcode(embedded) and so on. Anyway thanks for the work although even if I want I still can’t use it because of that .bash_profile thing. Maybe I am not “technical” enough. Nice tutorial Aaron! Thanks for sharing. I’ve created a similar one but with more focus on IDE setup and being able to debug the application. Might be something of interest to you as well as your followers. Mohammad, this is really great! It’s really nice to see a debug method included there as well. That’s something that I struggled getting to work when I was setting up. This is a really great resource. Thanks for sharing it. Many thanks for this post. It did work from the first time after I tried quite a few other posts without success. Could you please give us some insight on how to flash with a soft device? Thanks Aaron! I think this is probably the most concise guide I’ve seen for a microcontroller. There’s a few things I’m wondering though. (1) I have an nRF51 in addition to my nRF52. Are there any major changes in the set-up process for the nRF51? (2) Do you have any suggestions on what to do differently for flashing/config if I want to play with Bluetooth LE on these chips? Thank you for your kind words. They’re much appreciated. You shouldn’t have to do much to get it to work on an nRF51 – the only difference is going to be the various linked header files. Those will take care of all the heavy lifting of compiling with the right stuff for the chipset. Nordic did a good job of abstracting that stuff out so you can just write code. Potentially you could even write the same code for both chips if the file will point everything to the right pins. As for getting the BT to work, that’s unfortunately a little more than I’ve learned at this point. IIRC, it’s all a soft device load. Nordic has some tutorials that show how to load the soft device – after that I believe you just see it as a port to write to/read from. It’s been a while since I’ve looked at it though. Thanks for this write up Aaron! This was very helpful. In case anyone here is wondering how to flash a softdevice for running BLE scripts, you can run `make flash_softdevice` in the same directory where you are running `make` and `make flash`. Thanks Mark! And thank you for including this useful command for flashing the soft device, I think one of the things that really attracts people to the NRF5* series is the BT and the lack of needing to write your own drivers. Thanks for the article – this definitely saved me time! FYI: The setup and blinky code also worked to program a Rigado BMD-300 Evaluation Board. I’m glad to hear it helped Jay! Thanks for point out the dev board as well. I might check these out for a future project. It’s convenient to have the nrf52 in such a small package. Thanks for the link! I’m not a personal fan of Eclipse, but this definitely provides quick on-board process for folks.